It's hard to believe that the end of January is almost here! Which means Valentine's Day is quickly approaching. Usually, I don't buy much in the way of Vday attire and accessories but this year I've had so much fun with my coffee cups, pj's, and apparel! It's the perfect holiday for me because everything is super girly, covered in glitter, and pink. The great thing about Valentine's Day is that you can wear most things year round. It's not like Christmas where you have Santa and reindeer all over everything. Heart printed patterns and pink and red never go out of style, and are great additions for Spring, and even Summer! 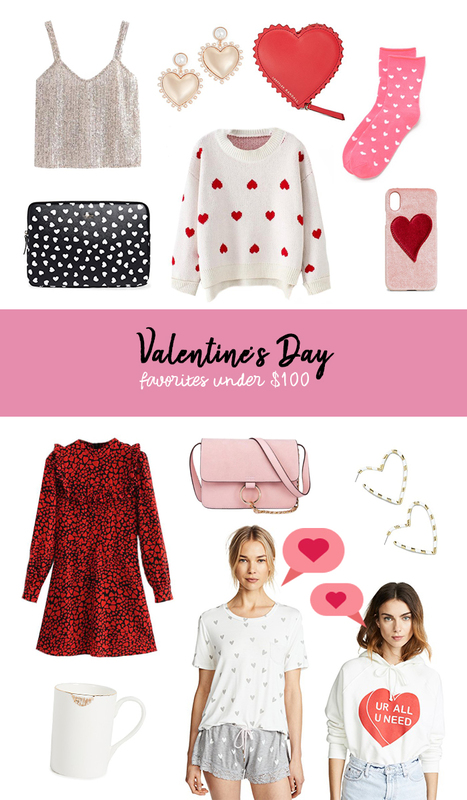 Above I picked out thirteen of my favorites for Vday... casual, pretty pieces you can wear even if you don't have plans on February 14th. With the holiday in the middle of the week, and with me traveling, J and I are planning a cozy night in - so pajamas, cozy socks and wine it is! If you've been following me on Instagram, you probably saw the cream sweater with red hearts. It's such a cute piece on and is very warm. I wore it traveling home from Idaho with a pair of leggings and sneakers. Also looking forward to wearing it with high waisted skinnies and heels too. I also bought the silver sparkly tank and will be sharing it in a try-on session very soon. It's such a fun piece you could wear underneath a blazer, or jacket now while it's cold, and by itself when the weather warms up. There are so many different ways to wear it. the weather is 60 below, please please stay warm and safe!